Royal Oldham Hospital, Pennine Acute Hospitals NHS Trust, Manchester, UK. Keywords: Amputation; lower limb; complications; wound healing; stump. Lower limb amputations account for the majority of all amputations in the UK, with peripheral vascular disease and diabetes being the major reasons for surgery. Within the population of patients with peripheral vascular disease, major lower extremity amputation results in significant perioperative morbidity and mortality. Potential wound-healing complications associated with lower limb amputation stumps include infection, tissue necrosis, pain, problems associated with the surrounding skin, bone erosion, haematoma, stump oedema and dehiscence. The highest rate of surgical site infection is associated with lower limb amputations. Wound healing outcomes for amputees can be maximised by multidisciplinary team working. The majority of patients undergoing amputation of the lower limb have peripheral vascular disease, often resulting in significant morbidity and mortality. The incidence of amputations is higher in smokers, rises with age and is higher in men than women. Furthermore, people with diabetes form just less than half of all amputees. Consequently, it is not surprising to find that such patient risk factors can result in an array of wound-healing difficulties, thus prolonging debilitation and reducing quality of life. The UK's increasingly ageing population means that more elderly patients will be operated on in the future, thus giving rise to a growing trend in postoperative tissue viability problems where skin fragility and multiple pathologies such as diabetes and peripheral vascular disease co-exist. Hence wound healing complications associated with amputation are becoming more commonplace, requiring sophisticated management strategies to meet the needs of these vulnerable patients. The most important factor in ensuring a successful amputation is the correct choice of amputation site based on assessment of limb perfusion and functional requirements. The following factors will affect the outcome of amputation: the patient's nutritional status, age, tissue perfusion, smoking habits, infection and the presence of co-existing diseases such as anaemia and renal failure. This paper describes a number of problems associated with amputation wound healing, including infection, tissue necrosis, pain, difficulties associated with the surrounding skin, bone erosion, haematoma, oedema and dehiscence/wound breakdown. It draws on the available literature to guide best practice in this complex area of surgical wound care and highlights the importance of multidisciplinary team working. The lower limb amputee population in England is thought to be around 52,000 . Patients who have undergone lower limb amputation account for 92% of all amputees referred to prosthetics centres in the UK . Significant geographical variation in lower extremity amputation rates has been reported in the UK, with variability in clinical decision-making a likely factor (though further research is required to explore the reasons for this) . The incidence of amputation is higher in smokers , rises steeply with age, with most amputations occurring in patients aged more than 60 years, and is higher in men than women . Diabetes is a significant factor in lower-limb amputation . People with diabetes constitute 50% of all major lower limb amputees . Diabetes-related lower extremity amputation rates have been found to be 12.5 to 31.6 times those of patients without diabetes . Approximately 85-90% of lower limb amputations in the developed world are caused by peripheral vascular disease, with the remaining amputations caused by infection secondary to diabetic foot ulceration . The incidence of lower limb amputation arising from vascular impairment or lower limb ischaemia increased from 56% in 1998/99 to 75% in 2004/05 in the UK . The authors point out that this increase could be attributed to improved data recording from prosthetic centres. Table 1 gives statistics from the Amputee Statisitical Database for 2004-2005 . Table 1: Conditions that contribute to lower limb amputation . Reproduced from: National Amputee Statistical Database. National Amputee Statistical Database Annual Report, 2005 . Amputation is performed at a number of different levels (see Figure 1). The most common continues to be the trans-tibial level, accounting for almost half of all referrals to the prosthetic services in the UK . Determining the ideal level of amputation for a patient depends on a number of factors. An holistic assessment considers factors such as healing potential, rehabilitation potential, prosthetic considerations, the patient's own wishes, discharge arrangements , and the extent of non-viable tissue on the affected limb . Consideration must be given to knee and hip function and the presence of joint prostheses. The final choice of the level of amputation is considered to be a compromise between ensuring primary wound healing and maximising the patient's function postoperatively . Wherever possible, patients should be empowered to make an informed decision about the level of amputation. People to involve in this process would be the surgeon, the vascular nurse, who can offer pre-operative counselling, the physiotherapist and possibly an 'expert' patient who has undergone amputation. All patients undergo a vascular surgical assessment before amputation  , which may involve a number of procedures, including transcutaneous oxygen (TcP02) measurements , laser Doppler flowmetry  and segmental pressures and ankle brachial pressure indices. Figure 1 - Adapted from Marcovitch, H, 2005 . 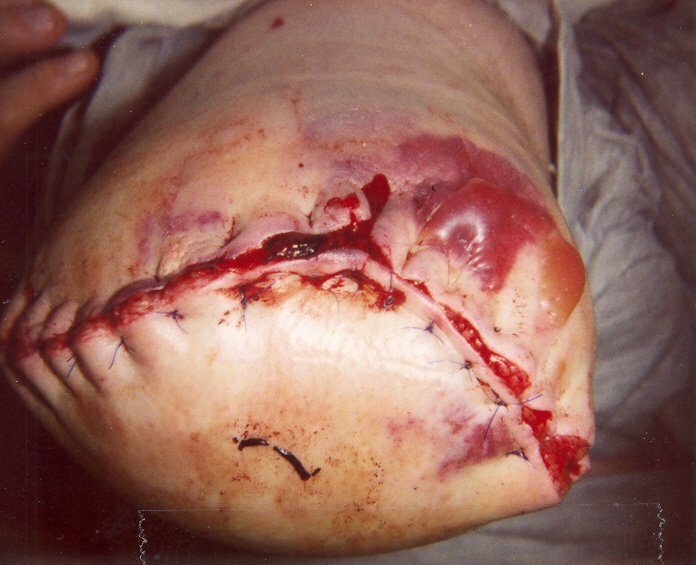 In most instances, surgeons performing a lower limb amputation will use the primary closure technique, in which the edges of the wound are closely approximated, thus eliminating dead space and involving minimal formation of granulation tissue . There may be a drain in situ which will be removed on the first or second postoperative day . The drain is often not sutured in place to allow its removal without disturbing bandages or dressings. It is advisable to assess amputation wounds regularly for evidence of problems such as offensive odour, haemorrhage or excessive exudate . In most cases surgical wounds are managed with a simple island dressing, orthopaedic wool padding and a light retention bandage. It could be argued that such low cost, traditional dressings are adequate for most surgical wounds. However, amputees with poor tissue integrity often require modern woundcare products that offer additional benefits, such as the low adherence offered by the soft silicone range. Indeed, dressing adherence as a result of dried blood products can cause trauma, pain and anxiety at dressing changes . Wound dressings also need to be robust enough to withstand movement and use of the stump; they should not limit or interfere with the patient's rehabilitation. There is a lack of agreement surrounding the length of time a surgically closed wound should be covered. Some clinicians argue that the wound can be left exposed after 24 to 48 hours  . However, others propose that exposure may contribute to wound pain, suggesting that the wound should remain covered until suture removal . In light of hospital-acquired infection rates, it would seem prudent to challenge regimens of the past and maximise the time a wound is covered. Moreover, the stump often requires additional protection from trauma, which can be experienced during transfer to and from the patient's wheelchair. A correctly placed stump bandage can be used to mould the stump and allow early mobilisation so may be left in place for four to five days, only being changed if there is increasing stump pain, odour or pyrexia. Practice varies according to local protocols - rigid plaster dressings are fitted in some centres in the immediate postoperative period, with reports of quicker wound healing and earlier ambulation . Surgical wounds that heal by primary intention are expected to heal successfully without complications . However, there is little evidence to demonstrate that this actually happens in practice. Although wound infection is acknowledged to be a significant problem in surgical wounds, there are anecdotal reports that other complications such as dehiscence, the splitting open of a closed wound, and skin blistering occur, yet these problems do not feature widely in the literature. It has been estimated that over six million operations were undertaken in the NHS in England and Wales in 1998-99 . However, advances in surgery would suggest that the number of surgical procedures and their resulting wounds are set to increase. The National Institute for Health and Clinical Excellence (NICE) estimates that, based on data from a surgical department of a district general hospital, there may be 21,000 difficult-to-heal surgical wounds per annum in England and Wales . NICE acknowledges that this number may be a significant underestimate. The UK has an ageing population, which suggests that an increasing number of elderly patients will be operated on in the future, thus producing a rise in postoperative tissue viability problems where skin fragility and multiple pathologies co-exist. Indeed, both Harding (1993) and Mulder et al (1998) have alluded to the need for awareness of demographic changes in relation to woundcare developments - tissue friability and prolonged wound repair associated with ageing are acknowledged to be key problems  . Within the population of patients with peripheral vascular disease, major lower extremity amputation results in significant perioperative morbidity and mortality  . Patients are often extremely debilitated, with multiple co-existing cardiovascular risk factors. The prognosis following amputation is poor: nearly a third of unilateral amputees lose the other limb within three years and half of them will die within five years . Wound healing complications associated with the stump of an amputee are important because in some cases these determine a patient's ability to walk with a prosthetic limb . One study concerning lower limb amputation found that the commonest stump-related complications were wound infection and poor healing (70%), poorly fashioned stumps (20%) and phantom pain (10%) . The healing rates for below- and above-knee amputations vary considerably. It is thought that a total of 90% of above-knee major amputations heal, 70% primarily, whereas for below-knee amputations, primary healing rates range between 30% and 92%, with a re-amputation rate of up to 30% . Important factors in healing and outcome of amputation include the patient's nutritional status, age, whether or not the patient smokes, the presence of old potentially infected graft material and the presence of co-existing diseases such as renal failure, diabetes and anaemia  . Site selection is considered a crucial factor as healing depends on the adequacy of perfusion. Healing also depends on the technical precision of the surgeon . The type of surgical technique used for below-knee amputation has not been found to have an effect on stump healing, wound infection, re-amputation rate or mobility with a prosthetic limb and is considered to be a matter of surgeon preference . Chalmers and Tambyraja conclude that no system is foolproof in predicting amputation healing . Wound healing complications are listed in Table 2 and are discussed below. Table 2: Potential wound healing complications associated with lower limb amputation stumps. Infection can pose serious complications for the amputee. Indeed, some clinicians recommend the use of prophylactic antibiotics to reduce the risk of sepsis. Methicillin-resistant Staphylococcus aureus (MRSA) continues to be a major problem in surgical practice. MRSA infection in patients undergoing vascular reconstructive surgery is considered to be a serious and disastrous complication . However, one study has demonstrated that in those patients specifically undergoing lower extremity amputation, MRSA infection does not adversely affect clinical outcome with respect to number of revisions, revision to higher level amputation, time to heal, length of hospital stay, or 30-day morbidity and mortality rates . It is recommended that aggressive wound monitoring should be routine in all patients . One complication is cellulitis, which is characterised by swelling, pain, pus formation, erythema, heat, sometimes accompanied by fever, leading in severe cases to septicaemia . Even localised wound infection can be problematic, resulting in excess exudate and breakdown of the suture line . A severe infection can lead to wound dehiscence , significant tissue necrosis and result in the need for further surgery. One retrospective review of lower extremity amputations for peripheral vascular disease found that wound infections featured as a complication in 5.5% of below-knee amputation limbs and 6.7% of above-knee amputation limbs . Figures from the Surgical Site Infection Surveillance Service in England  demonstrate that the highest rate of surgical site infection was reported in association with lower limb amputations. This is perhaps not surprising when many patients undergo amputation for grossly infected limb ulceration. The authors of this report explain that high infection rates are likely to be related to underlying risk factors that affect wound healing and vulnerability to infection, such as poor limb perfusion and diabetes. On average, patients with diabetes are approximately five times more likely to have a post-surgical wound infection than non-diabetics . Additional risk factors predisposing the amputee to infection include a past or current history of corticosteroid therapy and other disease processes leading to an immunocompromised state . When an amputation is performed in proximity to an existing infection, the incidence of postoperative infection is also higher . It is vital that these wounds are inspected on a regular basis for any signs or clues suggesting the possibility of infection and that practitioners are skilled in this monitoring process. Care should be taken not to confuse the signs of infection with the normal inflammatory phase of healing. Redness or erythema can also be mistaken for ischaemia or an allergic reaction to a prosthesis . If a wound is situated near bone and an infection is present, it is considered good practice to arrange an X-ray to exclude underlying osteomyelitis, which would require treatment before normal wound healing can continue . In addition to the use of systemic antibiotics, wound infection can also be addressed by enhancing the host defence mechanisms (for example controlling blood sugar levels), wound debridement, wound cleansing, increased frequency of dressing changes and use of topical antimicrobials such as silver or iodine dressings . Since the majority of amputations are carried out because of ischaemia, this patient population is particularly vulnerable to the development of tissue necrosis due to poor tissue perfusion. The tissue essentially becomes non-viable and can be clinically observed as dusky skin changes, mottled/purple discoloration, dry gangrene, wet gangrene or sloughy tissue (see Figures 2 and 3). Such discoloration or cyanosis of the skin at the incision line can result in wound breakdown soon after surgery or even skin necrosis in the non-viable areas several weeks later . The clinician's ability to differentiate between simple bruising and non-viable ischaemic tissue is vital. The latter is often cold and very painful. Any sign of tissue necrosis should be reported promptly to the surgical team . Figure 2 - Tissue necrosis developing on a stump wound causing wound breakdown. Figure 3 - Extensive tissue necrosis to a stump extending below the suture line characterised by discolored, cyanosed tissue. The presence of non-viable, necrotic tissue is significant as it can be responsible for delaying healing , prolonging the inflammatory response, mechanically obstructing contraction and impeding re-epithelialisation. It also provides a focus for wound infection . The need for debridement (the removal of dead or non-viable tissue) is dependent on the extent of non-viable tissue. If the area of necrosis is large, then debridement and possible surgical revision may be indicated . Small quantities of necrosis may not be clinically significant and are left to debride naturally by autolysis. Once the decision has been made to remove the non-viable tissue, the most appropriate method must be chosen. Factors such as type of tissue involved, amount of exudate production, time available and the patient's wishes should be considered here . The choice of debriding agent should be based on the impact on comfort, odour control and other aspects relevant to patient acceptability, type and location of wounds and total cost . One approach to debriding stump wounds is that of larval therapy (the use of sterile maggots). This practice is widely accepted in the UK. It is argued that it may offer advantages over surgical debridement because no general anaesthetic is required . Larval therapy can act as a useful form of debridement for stump wounds since surgical revision and debridement of a stump is often not an option for patients because of other co-morbidity factors. One case study has shown how the use of maggots rapidly cleansed an infected amputation wound and appeared to encourage the growth of granulation tissue and, by doing so, prevented the need for additional surgery . Reference is also made to the use of larval therapy as a form of debidement in difficult-to-heal surgical wounds in a guideline from NICE . Other methods of debridement include autolysis (a naturally occurring process in a moist environment), surgical (involving the surgical removal of tissue usually under a general anaesthetic) and sharp (a skilled practitioner using scissors or a scalpel to remove dead tissue at the patient's bedside). In terms of speed of debridement, the surgical method is most favourable; however, this approach is least favourable in terms of pain and cost . Due to the complex nature of stump wounds and the potential for extensive non-viable tissue to develop, they are likely to require ongoing maintenance debridement rather than a single intervention, a process described by Falanga . In 1990, the Royal College of Surgeons of England issued a report on postoperative pain control, arguing that failure to relieve pain is morally and ethically unacceptable . The report included a number of recommendations to improve the 'unsatisfactory' management of pain after surgery, including the introduction of acute pain services in hospitals, education of healthcare professionals and effective pain assessment techniques. In the context of lower limb amputation wounds, pain is a significant problem. It is thought that pain experienced after an amputation may scare and confuse patients  and features in case reports as a difficulty for patients . Amputees can experience two different types of pain: incisional stump pain and phantom pain. Stump pain is localised to the area immediately around the stump and the amputation scar  and is described by patients as 'pressing', 'throbbing', 'burning' and 'squeezing' . If unresolved, such pain is considered to negatively affect wound healing and to impact on quality of life . Phantom pain is a common problem, affecting between 8% and 10% of patients  and is usually reported during the immediate postoperative period but can persist for up to two years . In some cases, phantom pain can be a lifelong experience. It is literally pain experienced in the limb that has been amputated, and is often described as a crushing, tearing pain . Ellis points out that a large percentage of patients undergoing amputation have experienced chronic pain before their operation . Therefore, in some cases, a patient may exchange the pain of ishaemia for that of phantom limb pain . Other sources of pain in the lower limb amputee include infection, acute depression, pressure in a cast or prothesis  and tissue necrosis . Increasing pain may also be a sign of ischaemia; this may not be obvious if the deeper tissue rather than the skin is ischaemic. Successful relief of incisional stump pain can be achieved by the use of opiates, non-steroidal anti-inflammatory agents and local anaesthetics. Phantom limb pain may be relieved with anticonvulsants, tricyclic antidepressants, transcutaneous electrical nerve stimulation (TENS)  and therapeutic touch and massage. If the patient's pain is worsening and becoming unmanageable, despite appropriate interventions, referral to an acute pain service may be indicated. Pain continues to be a problem for surgical patients and has prompted investigations into pain in surgical wounds healing by secondary intention . Work by Foster and colleagues has shown that using Hydrofibre® dressings led to a reduction in wound pain, when compared with ribbon gauze dressings  and alginate dressings . Table 3 lists strategies that can help the patient with wound pain . Table 3: Suggested strategies for the relief of pain at dressing changes . Avoid any unnecessary stimulus to the wound, such as draughts from open windows. Handle wounds gently, being aware that any slight touch can cause pain. Topical application of local anaesthetics can be considered to help relieve local pain, although further research is needed to establish best practice. 'Gas and air', a self-administered gas comprising oxygen and nitrous oxide, used for the duration of the procedure, is another option. remains in situ for a longer period to reduce the need for frequent dressing changes. soaking is required for removal. Read the manufacturer's instructions about technique for removal. Adapted with permission from Briggs et al, 2002 . In relation to lower limb amputation wounds, complete dehiscence can expose muscle and bone . It occurs when the wound has failed to develop sufficient strength to withstand forces placed on it . Such forces can include trauma, either shear or, more commonly, direct trauma sustained in a fall. Too early removal of sutures and stump swelling placing tension on the wound are the other main causes. Other predisposing local factors include wound infection, suture technique, wound perfusion, haematoma and seroma . Systemic factors comprise diabetes, anaemia, old age and postoperative respiratory tract infection. Total dehiscence normally requires the patient to return to the operating theatre for surgical intervention to explore the wound, allow excision of any devitalised tissue and to close the wound . Signs of imminent dehiscence may include discharge of serosanguinous exudate . One approach to the management of dehisced amputation wounds healing by secondary intention is the use of topical negative pressure. This therapy has been used successfully in the management of dehisced wounds, although currently the evidence base is anecdotal  . The effective use of topical negative pressure therapy, such as the Vacuum Assisted Closure™ (VAC) system, lies with its ability to cope with copious quantities of exudate, thus protecting surrounding skin from maceration and excoriation, helping to reduce the risk of infection and avoiding soiling of the patient's bedclothes. It can also accelerate the proliferation of granulation tissue within the cavity wound, although, due to stump pain, not all patients can tolerate this therapy. Anecdotal evidence suggests that although VAC therapy itself may cause discomfort, patients benefit from improved wound stability and fewer dressing changes which, in some patients, can result in better overall pain control. A good example of the advantages of using the VAC sysyem in primary amputation management is found in Armstrong and Lavery (2005) . Other approaches to the management of dehisced stumps include the use of absorbent Hydrofibre® or alginate dressings, which are designed to handle heavy exudate. Simple dressing pads will usually meet the requirements of the secondary dressing as they come in sizes large enough to conform to extensive stump wounds, and may be retained by cotton tubular stockinette. The complex and challenging nature of dehisced amputation wounds has been highlighted in the literature, which describes how members of the multidisciplinary team are required to work together to achieve a satisfactory patient outcome . After amputation the patient can experience a number of problems involving the skin surrounding the wound. First, skin blistering (Figure 4) can occur where, according to Gupta et al , the epidermis is separated from the dermis as a result of repeated friction to the skin. This may cause complications such as infection and prolonged healing time requiring additional dressings. This will require more nursing time and may lead to delayed discharge from hospital. Blistering is also caused by traction, infection (with beta haemolytic streptococcus), allergy and oedema. Stump wounds swell and this must be taken into account when choosing and applying dressings. The postoperative dressing may contribute to blister formation through lack of elasticity and the presence of postoperative wound oedema . This theory is echoed by Pudner  and Ballard and Baxter , who claim that some dressings with adhesive borders may cause blistering to the surrounding skin if applied at tension. Postoperative stump dressings should therefore be low-adherent, non-adhesive and absorbent. Patients should be questioned pre-operatively about any known allergies to solutions (such as iodine) or dressings which could complicate wound healing. The practice of bursting or de-roofing blisters should be avoided in order to reduce the risk of wound infection and further patient discomfort. 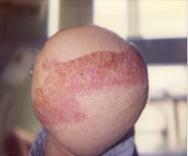 Figure 4 - An example of blistering. If wound breakdown has occurred, exudate can be heavy, risking peri-wound excoriation or maceration , and making the area sensitive and painful . In such situations, skin protectants should be considered, such as barrier films or zinc oxide paste. The recommended wear time of the dressing must not be exceeded as this can cause maceration through the leakage of exudate on to the surrounding skin . Damage to delicate skin through the injudicious use of adhesive tape should be avoided , especially as allergic skin reactions can occur (see Figure 5). As an alternative, disposable pants  or tubular stockinette   can prove useful in retaining dressings with no trauma to the surrounding skin. The ideal initial stump dressing comprises cotton wool, stockinette and no tape . Tight or elasticated bandages are not recommended in the vascular amputee as they are thought to generate unacceptable pressures and cause tissue breakdown . A limb with impaired sensation will be susceptible to the development of ulcers and blisters in a prosthesis as a result of trauma leading to friction or pressure in the prosthetic socket once the original wound has healed  . Patients undergoing amputations involving the foot, such as the transmetatarsal procedure, are particularly prone to pressure, shear and friction damage. Multidisciplinary teams including podiatry and orthotics staff should be involved with this patient group to help maximise the tissue integrity of the remaining limb. Figure 5 - Contact dermatitis to the distal end of a stump caused by the application of tape. In some cases, retraction of muscle can occur over the stump with erosion of bone through the skin  . Bone can also become exposed within a dehisced wound (see Figure 6). This situation usually requires surgical revision unless the degree of bone exposed is minimal and granulation tissue can cover the defect through healing by secondary intention. As with any wound exposing bone, the risk of osteomyelitis is high. Figure 6 - A dehisced above-knee amputation wound exposing the femur. On occasions, healing can be delayed by the presence of a deep, often infected, sinus (Figure 7). Such wounds can be defined as blind-ended tracks, lined with epithelium and granulation tissue that extend from the skin to the subcutaneous tissues  where an underlying cavity within a sinus has the potential to become an abscess . These wounds can produce high levels of purulent exudate, necessitating prolonged antibiotic therapy. In some situations osteomyelitis is revealed on X-ray, in which case more aggressive antibiotic therapy or surgical revision may be indicated. The problem may be caused by a foreign body or material in the stump such as bone wax, a suture, graft material or, in the case of traumatic amputation, dirt. The most effective way to manage a sinus is to lay it open by surgical intervention ; however, in the case of amputation wounds, further surgery may not be a favourable option. Indeed, the risks of more surgery include a shorter stump and a poor rehabilitation outcome. Decisions regarding the management of sinus wounds in this instance should be made carefully, involving the multidisciplinary team, as they have significant implications for patient care. Sinus dressings aim to prevent adherence of wound edges and stop premature closure. Modern dressings such as alginates and Hydrofiber® are useful . Figure 7 - Stump sinus masking underlying osteomyelitis. A haematoma is a localised collection of blood which can form in an organ, space or tissue . It acts as a focus for infection and can create dead space, weakening the suture line  and thus increasing tension in the wound . In most cases they drain on their own, without the need for surgical intervention; however, large amounts of clotted blood may warrant prompt surgical debridement . Wounds with no drainage may be at risk of haematoma formation under the suture line, causing tension and oedema at the wound site, as well as providing ideal conditions for bacterial growth . Partridge believes that the increased tension under the suture line can lead to a disruption in blood supply, resulting in dehiscence and necrosis . Once again, skilled assessment techniques are paramount in detecting signs that a haematoma has developed and, if it has, the surgical team must be informed promptly. Excessive and prolonged stump swelling or oedema is thought to be due to pre-existing venous insufficiency, generalised fluid retention (usually due to congestive cardiac failure) and chronic hypervascularity (often seen in patients with diabetes who do not have significantly impaired arterial blood flow) . Deep vein thrombosis (DVT) can also be a cause of limb swelling. A diagnosis of DVT is frequently associated with the lower limb amputee . Other causes may include hypoproteinaemia, stump dependency and infection. It is essential to identify and, where possible, treat the underlying cause of stump oedema. Nutritional support may be required in the form of high protein supplementation. A stump wound associated with excess oedema and resulting exudate is likely to heal slowly, if at all. It is now believed that, in some instances, components of wound exudate can be harmful to wound healing and the condition of the surrounding skin . Measures must be taken to achieve an acceptable balance of exudate. 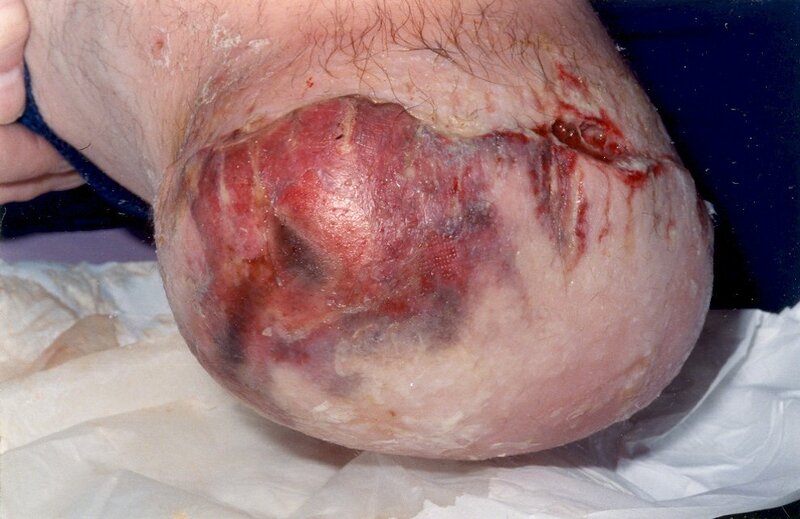 Excess wound drainage or exudate can be attributed to seroma/haematoma formation and infection . Postoperative oedema of the amputation site may be overcome by a strict regimen of limb elevation   . All amputees who have a below- or through-knee amputation must have a padded stump board fitted to their wheelchair so that the stump is at the same level as the chair  and is supported at all times. This will help prevent dependent oedema and possible wound breakdown . If the patient is likely to benefit from a prosthesis, physiotherapists will promote the use of a pneumatic post-amputation mobility aid to help reduce oedema and phantom limb sensation . Correct choice of wound dressing is paramount in order to achieve the appropriate moisture balance within the wound. Topical negative pressure therapy, as previously described, can benefit exuding stump wounds. The therapy involves the application of local sub-atmospheric pressure across the wound and has an important role in acute wound management . It is reported to manage stump wound exudate effectively  and contribute to oedema reduction. VAC therapy has been shown to help promote healing in a diabetic amputation site . When considering the positioning of absorbent primary and secondary dressings in the handling of high levels of exudate, consider the position of the patient, as this will influence the direction of flow of fluid . Most amputees with stump wounds should have their stump supported on a horizontal surface rather than in a downward position, and thus dressings should be applied accordingly. Skin hygiene is important in patients with oedema, where the compromised cellular and lymphatic function means that infection is more readily acquired and may proceed to cellulitis . Once complete wound healing has been achieved, swelling of the stump should be controlled by stump compression in the form of elastic stump socks . Elastic bandaging of amputation stumps continues to be recommended in the USA to reduce postamputation oedema  . Indeed, it is thought to protect healing tissue, retain dressings, reduce swelling and shape the residual limb for prosthesis . Vigier et al compared plaster casting with elastic compression bandages in patients with recent transtibial amputation and found that plaster cast dressings resulted in quicker healing times and shorter periods of hospitalisation . Wounds associated with amputation of the lower extremity continue to be a challenge. Patients who endure such wounds are often in poor health, with co-existing medical pathologies. Wound healing outcomes for amputees can be improved through multidisciplinary teams working together. Such healthcare professionals need to be equipped with the appropriate knowledge and skills in wound management to meet the needs of this vulnerable patient population. Surgical wound management in the lower extremity amputee has moved into a new era where complications such as infection, tissue necrosis and dehiscence are demanding more sophisticated therapies. 1. Marcovitch H, editor. Black's Medical Dictionary. London: A&C Black Publishers, 2005. 2. BMJ Publishing Group. Clinical Evidence. Diabetes. Foot Ulcers and Amputation in Diabetes Glossary item (updated September 2005); available from URL: http://www.clinicalevidence.com/. 3. Tisi PV, Callam MJ. Type of incision for below knee amputation. Cochrane Database Syst Rev 2004; (1): CD003749. 4. National Amputee Statistical Database (NASDAB). National Amputee Statistical Database Annual Report 2004/2005. Edinburgh: NASDAB, 2005. Available from URL: http://www.nasdab.co.uk. 5. 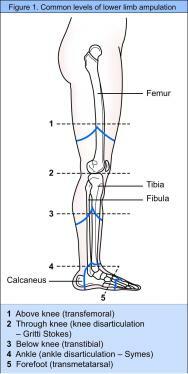 Canavan R, Connolly V, Mcintosh J, Airey M, Unwin N. Geographic variation in lower extremity amputation rates. Diabetic Foot 2003; 6(2): 82-9. 6. Vowden KR, Vowden P. Peripheral arterial disease. J Wound Care 1996; 5(1): 23-6. 7. Global Lower Extremity Amputation Study Group. Epidemiology of lower extremity amputation in centres in Europe, North America and East Asia. Br J Surg 2000; 87(3): 328-37. 8. Dormandy J, Heeck L, Vig S. Major amputations: clinical patterns and predictors. Semin Vasc Surg 1999; 12(2): 154-61. 9. Edmonds M, Boulton A, Buckenham T, Every N, Foster A, Freeman D, et al. Report of the Diabetic Foot and Amputation Group. Diabet Med 1996; 13(9 Suppl 4): S27-42. 10. Donohue S, Sutton-Woods P. Lower limb amputation. In: Murray S, editor. Vascular Disease. Nursing and Management. London: Whurr Publishers, 2001. 11. Datta D. Amputation, rehabilitation and prosthetic developments. In: Beard JD, Gaines PA, editors. Vascular and Endovascular Surgery. Second edition. London: WB Saunders, 2001. 12. Gibson J. Lower limb amputation. Nurs Stand 2001; 15(28): 47-52. 13. Audit Committee of the Vascular Surgical Society of Great Britain and Ireland (VSSGBI). Recommendations for the management of chronic critical lower limb ischaemia. Eur J Vasc Endovasc Surg 1996; 12(2): 131-5. 14. Bale S, Jones V. Wound Care Nursing:A Patient-Centred Approach. London: Bailliere Tindall, 1997. 15. Wutschert R, Bounameaux H. Determination of amputation level in ischemic limbs. Reappraisal of the measurement of TcP02. Diabetes Care 1997; 20(8): 1315-8. 16. Kram HB, Appel PL, Shoemaker WC. Prediction of below-knee amputation wound healing using noninvasive laser Doppler velocimetry. Am J Surg 1989; 158(1): 29-31. 17. Robinson KP, Hoile R, Coddington T. Skew flap myoplastic below-knee amputation: a preliminary report. Br J Surg 1982; 69(9): 554-7. 18. McWhinnie G, Roseburgh M. The initial management of lower limb amputations. Nurs Times 1999; 95(40): 48-9. 19. Gunnewicht B, Dunford C. Fundamental Aspects of Tissue Viability Nursing. London: Quay Books, 2004. 20. Wilson-Barnett J, Batehup L. Patient Problems:A Research Base for Nursing Care. Harrow: Scutari Press, 1988. 21. Chrintz H, Vibits H, Cordtz TO, Harreby JS, Waaddegaard P, Larsen SO. Need for surgical wound dressing. Br J Surg 1989; 76(2): 204-5. 22. Briggs M. Surgical wound pain: a trial of two treatments. J Wound Care 1996; 5(10): 456-60. 23. van Velzen AD, Nederhand MJ, Emmelot CH, Ijzerman MJ. Early treatment of trans-tibial amputees: retrospective analysis of early fitting and elastic bandaging. Prosthet Orthot Int 2005; 29(1): 3-12. 24. Watret L, White R. Surgical wound management: the role of dressings. Nurs Stand 2001; 15(44): 59-62, 64, 66. 25. National Institute for Health and Clinical Excellence. Guidance on the use of debriding agents and specialist wound care clinics for difficult to heal surgical wounds. In: Technology Appraisal Guidance No. 24. London: NICE, 2001. 26. Harding K. Wound care in an ageing population. J Wound Care 1993; 2(6): 366-9. 27. Mulder GD, Brazinsky K, Harding KG. Factors influencing wound healing. In: Leaper D, Harding KG, editors. Wounds: Biology and Management. Oxford: Oxford Medical Publications, 1998. 28. Dean RH. Lower extremity amputations. In: Dean RH, Yao JST, Brewster DC, editors. Current Diagnosis and Treatment in Vascular Surgery. Stamford, Conn: Appleton and Lange, 1995. 29. Aulivola B, Hile CN, Hamdan AD, Sheahan MG, Veraldi JR, Skillman JJ, et al. 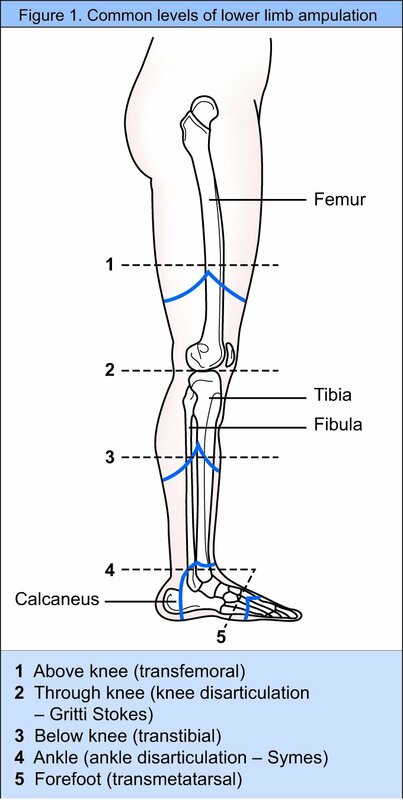 Major lower extremity amputation: outcome of a modern series. Arch Surg 2004; 139(4): 395-9; discussion 399. 30. Herbert L. Caring for the Vascular Patient. London: Churchill Livingstone, 1997. 31. White SA, Thompson MM, Zickerman AM, Broomhead P, Critchley P, Barrie WW, et al. Lower limb amputation and grade of surgeon. Br J Surg 1997; 84(4): 509-11. 32. Vowden K, Spark I, Vowden P. Lower limb amputation: planning surgery. J Wound Care 1998; 7(4): 205-8. 33. Eneroth M, Persson BM. Risk factors for failed healing in amputation for vascular disease. A prospective, consecutive study of 177 cases. Acta Orthop Scand 1993; 64(3): 369-72. 34. Chalmers R, Tambyraja A. Diabetic foot disease: how are amputations performed? Diabetic Foot 2002; 5(4): 170-8. 35. Nasim A, Thompson MM, Naylor AR, Bell PR, London NJ. The impact of MRSA on vascular surgery. Eur J Vasc Endovasc Surg 2001; 22(3): 211-4. 36. Cerveira JJ, Lal BK, Padberg FT, Pappas PJ, Hobson RW. Methicillin-resistant Staphylococcus aureus infection does not adversely affect clinical outcome of lower extremity amputations. Ann Vasc Surg 2003; 17(1): 80-5. 37. Grey JE. Cellulitis associated with wounds. J Wound Care 1998; 7(7): 338-9. 38. Stringfellow SC, Cooper PJ. Above the knee amputation wound which dehisced following surgery. Br J Nurs 2000; 9(12): S30-2, S34, S36. 39. Baxter H. Management of surgical wounds. Nurs Times 2003; 99(13): 66-8. 40. Surgical Site Infection Surveillance Service. Surgical site infection surveillance in England. CDR Weekly 2006; 14(21): 1-5. Available on URL http://www.hpa.org.uk. 41. Ray RL. Complications of lower extremity amputations. Topics Emergency Med 2000; 22(3): 35-42. 42. Berry DP, Jones V. Cavity wound management. J Wound Care 1993; 2(10): 29-32. 43. Dowsett C, Edwards-Jones V, Davies S. Infection control for wound bed preparation. In: Moore K, editor. A journey through TIME: Wound bed preparation in practice. Br J Comm Nurs 2004; 9(9 TIME Suppl): 12-17. 44. Flanagan M. Wound Management. London: Churchill Livingstone, 1997. 45. Baharestani M. The clinical relevance of debridement. In: Baharestani M, Gottrup F, Holstein P, Vanschedt W, editors. The Clinical Relevance of Debridement. Berlin: Springer-Verlag, 1999. 46. Jones M, Andrew A. Larval therapy. In: Miller M, Glover D, editors. Wound Management. London: Nursing Times, 1999; 129-33. 47. Thomas S. The use of maggot therapy in an infected amputation wound: a case report. Scot Niurse 2003; 8(4): 26-8. 48. Sibbald RG, Williamson D, Orsted HL, Campbell K, Keast D, Krasner D, et al. Preparing the wound bed: debridement, bacterial balance, and moisture balance. Ostomy Wound Manage 2000; 46(11): 14-22, 24-8, 30-5; quiz 36-7. 49. Falanga V. Wound bed preparation and the role of enzymes: a case for multiple actions of therapeutic agents. Wounds 2002; 4(2): 47-57. 50. Commission on the Provision of Surgical Services. Report of the Working Party on Pain after Surgery London: Royal College of Surgeons of England and The College Anaesthetists, 1990. 51. Ellis K. A review of amputation, phantom pain and nursing responsibilities. Br J Nurs 2002; 11(3): 155-7, 160-3. 52. Jensen TS, Nikolaisen L. Phantom pain. In: Wall PD, Melzack R, editors. Textbook of Pain. Fourth edition. Edinburgh: Churchill Livingstone, 1999; 34. 53. World Union of Wound Healing Societies. Principles of Best Practice: Minimising Pain at Wound Dressing-related Procedures. A consensus document. London: MEP Ltd, 2005. Available from URL: http://www.wuwhs.org. 54. Hill A. Phantom limb pain: a review of the literature on attributes and potential mechanisms. J Pain Symptom Manage 1999; 17(2): 125-42. 55. Duncan F, Haigh C, Marshall J, Wriggley P. The management of ischaemic and periampuation pain. Br J Nurs 2001; 10(16): 1034-9. 56. Dziewulski P, James S, Taylor D, Bosanquet N, Cutting K, West P. Modern dressings: healing surgical wounds by secondary intention. Hosp Med 2003; 64(9): 543-7. 57. Foster L, Moore P. The application of a cellulose-base fibre dressing in surgical wounds. J Wound Care 1997; 6(10): 469-73. 58. Foster L, Moore P, Clark S. A comparison of hydrofibre and alginate dressings on open acute surgical wounds. J Wound Care 2000; 9(9): 442-5. 59. Briggs M, Torra i Bou JE. Pain at wound dressing changes: a guide to management. In: EWMA, editor. Pain at Wound Dressing Changes. European Wound Management Association Position Document. London: MEP Ltd, 2002. Available from URL: http://www.ewma.org. 60. Perkins P. Surgical wounds. Wound dehiscence: causes and care. Nurs Stand Spec Suppl 1992; 34: 12-14. 61. Pudner R. Managing cavity wounds. J Comm Nurs 1998; 12(3): 22-30. 62. Ballard K, Baxter H. Vacuum-assisted closure. Nurs Times 2001; 97(35): 51-2. 63. Morton N. Use of topical negative pressure therapy in postoperative dehisced or infected wounds. J Wound Care 2004; 13(8): 346-8. 64. Armstrong DG, Lavery LA, Diabetic Foot Study Consortium. Negative pressure wound therapy after partial diabetic foot amputation: a multicentre, randomised controlled trial. Lancet 2005; 366(9498): 1704-10. 65. Gupta SK, Lee S, Moseley LG. Postoperative wound blistering: is there a link with dressing usage? J Wound Care 2002; 11(7): 271-3. 66. Jester R, Russell L, Fell S, Williams S, Prest C. A one hospital study of the effect of wound dressings and other related factors on skin blistering following total hip and knee arthroplasty. J Orthopaedic Nurs 2000; 4(2): 71-7. 67. Ballard K, Baxter H. Developments in wound care for difficult to manage wounds. Br J Nurs 2000; 9(7): 405-8, 410, 412. 68. Cutting KF. The causes and prevention of maceration of the skin. J Wound Care 1999; 8(4): 200-1. 69. White R. Managing exudate. Nurs Times 2001; 97(14): 59-60. 70. Chadwick SJ, Wolfe JH. ABC of vascular diseases. Rehabilitation of the amputee. BMJ 1992; 304(6823): 373-6. 71. Isherwood PA, Robertson JC, Rossi A. Pressure measurements beneath below-knee amputation stump bandages: elastic bandaging, the Puddifoot dressing and a pneumatic bandaging technique compared. Br J Surg 1975; 62(12): 982-6. 72. Morrison M, Moffatt C, Bridel-Nixon J, Bale S. Nursing Management of Chronic Wounds. Second edition. London: Mosby, 1997. 73. Dealey C. The Care of Wounds. Second edition. Oxford: Blackwell Science, 1996. 74. Naylor W, Lavery D, Mallet J. Management of specific wound types. In: Naylor W, Lavery D, Mallett J, editors. Handbook of Wound Management in Cancer Care. Oxford: Blackwell Science, 2001. 75. Butcher M. Managing wound sinuses. Nurs Times 2002; 98(2 NT Plus). 76. Partridge C. Influential factors in surgical wound healing. J Wound Care 1998; 7(7): 350-3. 77. Burke B, Kumar R, Vickers V, Grant E, Scremin E. Deep vein thrombosis after lower limb amputation. Am J Phys Med Rehabil 2000; 79(2): 145-9. 78. Scanlon E. Moisture balance and exudate control. In: Moore K, editor. A journey through TIME: wound bed preparation in practice. Br J Comm Nurs 2004; 9(9 TIME Suppl): 18-24. 79. Van Urk H. Above knee amputation. In: Greenhalgh RM, editor. Vascular and Endovascular Surgical Techniques. Fourth edition. London: WB Saunders, 2001. 80. Bryant G. Stump care. Am J Nurs 2001; 101(2): 67-71. 81. Banwell PE, Musgrave M. Topical negative pressure therapy: mechanisms and indications. Int Wound J 2004; 1(2): 95-106. 82. Fawcett J. Use of adjunctive therapy to heal a diabetic amputation site. J Wound Care 2000; 9(7): 330-3. 83. Anderson I. Practical issues in the management of highly exuding wounds. Prof Nurse 2002; 18(3): 145-8. 84. Casey G. Oedema: causes, physiology and nursing management. Nurs Stand 2004; 18(51): 45-51. 85. Vigier S, Casillas JM, Dulieu V, Rouhier-Marcer I, D'Athis P, Didier JP. Healing of open stump wounds after vascular below-knee amputation: plaster cast socket with silicone sleeve versus elastic compression. Arch Phys Med Rehabil 1999; 80(10): 1327-30. 86. Hayes DD. How to wrap a below-the-knee amputation stump. Nursing 2003; 33(2): 28.